I have an avocado tree that is about 16 months old planted in a 5 gallon pot. It is about 3 feet tall, just starting branches at the top, very thin. the leaves fell off the bottom about 1 1/2 feet up. It will not stand up on its own without a post holding it up, but it is thriving well. Don't know what to do for it to grow a more sturdy trunk to support itself. Advice needed. Is it getting plenty of light? Yes. Indoors, I keep it by a window and now, in the summer, it is outside in the sunlight. I never did pinch it back. I am wondering if that is my problem. I'm thinking too much high nitrogen fertilizer and insufficient potash. What have you used to feed the plant? I'm no expert on avacadoes, but there are plenty of people here who have grown them. You might try tying it as high on the stake as is needed, then try tying it lower in gradual degrees as the stem toughens up. 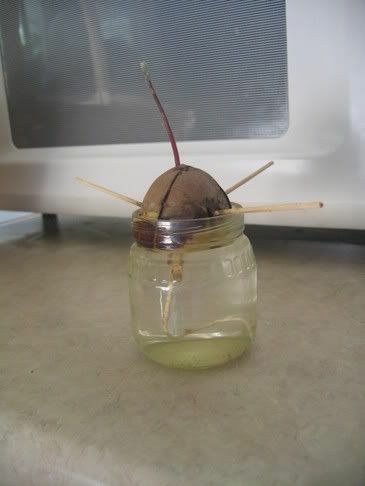 Most obvious is to give an avocado tree bright light. Also, the stretch for light is exaggerated when warmth stimulates growth, so the ideal spot for the plant is at the brightest window in the coolest room. Beyond that pruning back a stem or pinching out its growing tip stimulates branching by awaking dormant buds (not all are shed) further down the stem. There is nothing that can be done about the shedding of older leaves. Thankyou all for the advice, I will follow up on them. I have not fed it at all. I planted it in potting soil. Again, the stem is very thin and not robust enough to support its own weight. I will try to feed it and I believe I may have to pinch it back some. I will wait another few days before doing this to check on some more advice. I rooted it in a baby food jar. Thanks bunches! Please help! I don't want to mess it up now! Just plant it into a pot half as big again as the root ball. Or you can go a bit bigger if you want. Keep the potting mix on the dry side of moist. The only root it has at this point is a tap root...Do you mean the seed? Thanks! Your plant looks great. I have never had any luck growing avocados in water. I just start them in potting soil and they eventually grow. I have two now and am working on a third. They are over a foot tall and have quite a few big dark green leaves. Good luck with yours. Thanks! What size pot did you start yours in? I don't want to put it in a pot it will outgrow too quickly, but also don't want to go too big. Would a 6 inch pot be ok to start or should I go ahead and do a 10 inch? Would a 6 inch pot be ok to start or should I go ahead and do a 10 inch? A 6" pot is OK or a 10" pot should be fine as the growing season has a little way to go yet. Give it a drink of seaweed extract before and after transplanting. Once the weather cools and the plant stops growing, backoff on the waterings. Don't feed it with too much high nitrogen fertilizer or it will get leggy and ensure it has plenty of sunlight. Esp' morning sun to about 2pm. Hot and cold winds are also to be avoided. i always heard that you have to get a branch from a male or female (not sure which) to merge w/it to get fruit. is that true? first of all you need to put your tree outside in morning sun and afternoon shade until it adapts to outside weather.than you can give it more sun. also you must cut 6 to 12 inches off the top.this will force the growth down into the roots where it is needed.then you will see your tree branch out. good luck. usually its good to wait until your plant has about 5 leaves to transplant.but since yours is in such a small jar,i would say, put it in a larger container with good growing soil.when it gets a little bigger pinch or cut the top off and start taking it outside so that it gradually adapts to being outdoors.if it starts to get to tall keep pinching the top off until it branches out.